Here's Ii riding on his pony. Glad he's finally painted up after being stored in a box for a long time. He was an ebay purchase years ago - before I started painted wargaming figures. I only have a couple more old large scale resin kits remaining; which I'll eventually paint up. Waste not, want not is my mantra. Admittedly I hesitated starting on him back in the day because of the fairly large number of separate parts. Now, they seemed like working on a box of 28mm figures - so went for it. Although there a number of parts, they all fit together perfectly - including the reins - which on some kits are a bit fiddly. Notice how small the horse is - which is historically accurate. Below, Ii is with another 120mm resin kit which was painted many years ago; as well as some Perry 28mm figures for comparison. Thanks for following this project. I hope to start on some Crusader Retiarii and laso dudes. Ii is pretty much finished; although his sword still needs to be painted and attached. The horse and it's bells and whistles are next. I left the sleeves plain - without decorative mon or other designs. Didn't want it to become too "busy" and detract from the overall look - which seems appropriate for the Age of War. The brigandine work at the top of his suneate, as well at the neck and shoulders are nicely sculpted. The slots in the back of the cuirass are for the sashimo holder. I may not add a sashimo as I don't think high ranking commanders wore them. Worked a bit on the armor. After spray painting the armor red, a sepia wash was applied. After the wash dried, the lacing was painted blue. Finally the red was given a bit of highlighting. Still have to touch up some of the lacing, but the majority of the armor is done. The Crusader Retiarii and Arena Officials ordered from Age of Glory arrived in the mail yesterday. Another order which took less than a week - so much stuff in the paint queue. Hail Antony! Actium Playtest Success! Thanks to my fellow-Hawaiian expat, Kimo, a great playtest for the Actium game was just concluded. Kimo brought over a few nicely painted ships which were added as armed escorts for Cleopatra's squadron. The victory conditions for Antony's fleet was allowing Cleopatra to break out with her cargo ships intact enroute to Egypt. This and either destroying or capturing Octavian. The scenario has Octavian's placement unknown to Antony's forces - just as it was historically. Octavian's victory conditions would be the capture of Cleopatra and/or the destruction of Antony. Antony's command ship being known to Octavian. An alternative victory condition was the overall number of ships destroyed. This was the case for our game after six turns. Antony's forces run by Kimo destroyed far more of Octavian's ships and was declared the winner of the game. This despite Cleopatra being unsuccessful in her bid to escape. 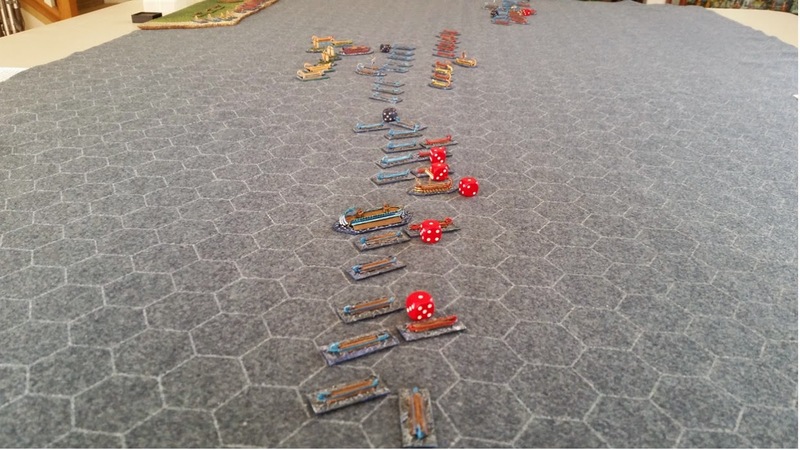 The rules are based loosely on Hail Caesar - mainly the command activation rolls at the top of the turn. All of Octavian's commanders had rating of 9 (this due to Antony's plans being known to them), and all of Antony's commanders having a rating of 8. Antony himself retained a 9 rating due to his force of personality. Here are some images of the game. Another view of Octavian's right squadron - he was actually in this squadron and his command vessel destroyed. Kimo actually destroyed the command vessel that Octavian was in - here on the right flank. A subordinate took over the command with a lowered command rating. This actually should've ended the game, but in the heat of battle we continued with the game. 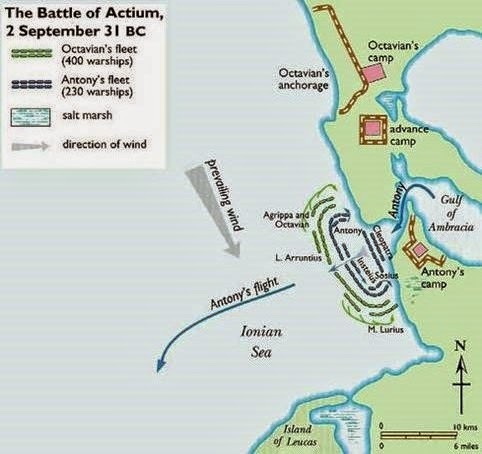 One thing Kimo pointed out later, after another of Octavian's command was destroyed was that the replacement command vessel should not occupy the area the previous one was destroyed in. That made sense and will be incorporated in future games. A view of the center of the battle - Cleopatra's squadron behind Octavius' squadron. 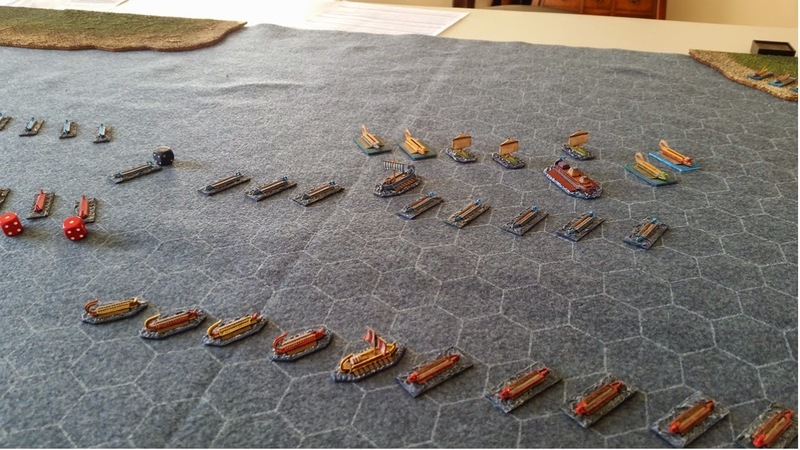 To keep the game simple enough for convention play, only Cleopatra's and Antony's ships were classed as Deceres, and command ships on both sides classed as Quadriremes. 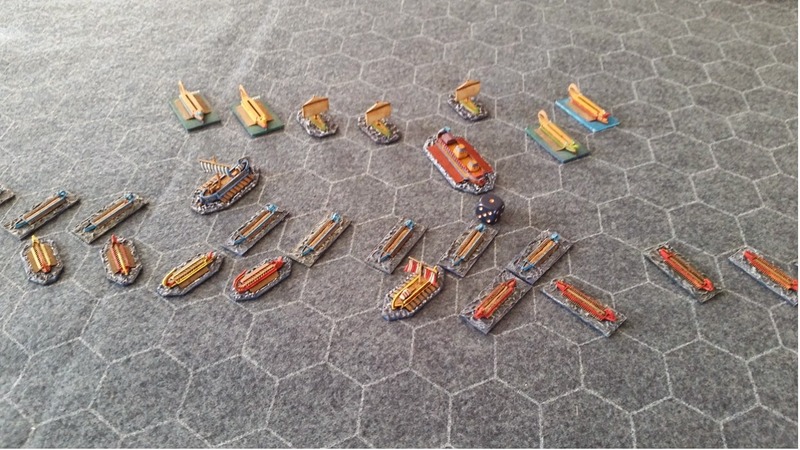 All covered deck ships (painted in either red or blue) classed also as Quadriremes. Open decked ships classed as Triremes. The few open decked ships with fancy prows and tails were classed as Liburnians - and these only in the center squadron of Octavian's fleet. Antony's squadron getting the better of Agrippa - which was not the historical case, of course! Another thing we discovered was that although missile fire can cause some damage, it was best to engage in close combat, and ram if possible. To successfully ram required a separate activation score. The beach of captured or destroyed ships - note they are mostly red ones formerly from Octavian's fleet. Behind them are the recently painted Irregular minis legionaries and marching camp. I've ordered a few more to beef up the look. Action in the center - Cleopatra's ship still behind Octavius' squadron. Here's an updated QRS from notes taken during the play test. Besides resuming painting on the Ii Naomasa figure, I'll be trying out the Gladiatorial Combat rules for the other game I am committed to host at Enfilade! in May. Just a quick update with the head/helmet of the figure completed. I'm pleased with the way the horns/antennae attached to the helmet. As mentioned in the previous post on the subject, the antennae are from another kit so attachments for it had to be made. At first I thought I could pin them onto the helmet, but realized the antennae were too thin for drilling. Slots were successfully made into the sides of the resin helmet and voila! The blue cords make a nice contrast to the red armor. Apparently warfare tends to go hand in hand with gaudiness. Will start on the body of the figure next; however, a play test for the Actium game will commence shortly. 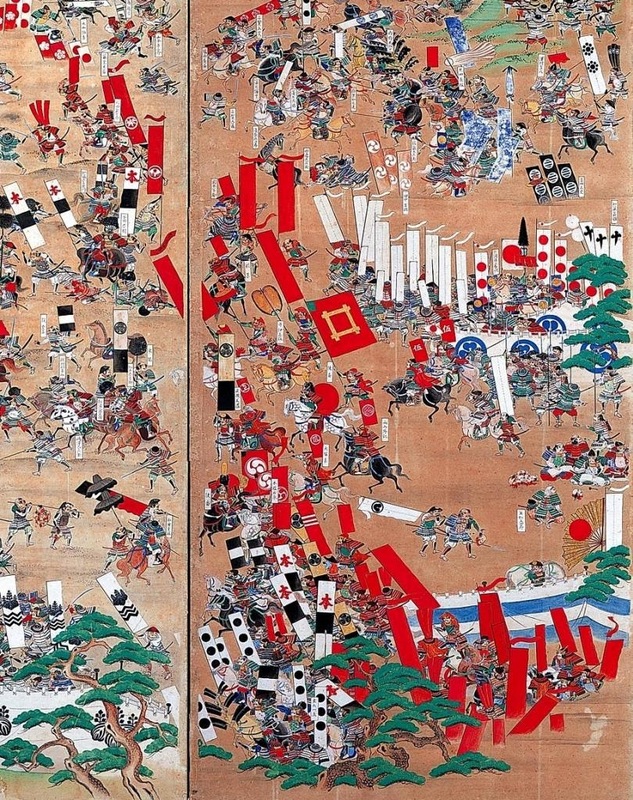 Below is a section of a scroll with Ii and his troops - the famous "Red Devils" at the Battle of Sekigara in 1600. Guess the British Paras weren't the first to use the nom de guerre. Ii played a prominent role in the battle, his units being the first to engage the enemy. He was wounded by a stray bullet near the end of the battle. He died in 1602, likely caused by the wound received at Sekigahara. Well before I could resume work on the 120mm Ii Naomasa figure, my wife brought in the mail and the Irregular Miniatures figures had arrived. Very impressive as I just placed the order earlier in the week. So from the UK to here in the Pacific NW under a week shipping. The were primed black and quickly brushed with a fairly small tipped brush. I used a dry-brush technique, lightly dragging the brush over the raised features. Gold for the helmets, flesh for the faces and legs, and red for the shields. The mounted command figures were basically done the same way - with horses of course. That is a grain of rice on in the right forefront for scale. The models are two packs of three 20-figure strips of infantry each, one pack of 3 strips of mounted command, and a marching fort. They'll line the shore for the Actium game - just an aesthetic addition and nothing to do with the game mechanics. The image above shows the rear view of the figures. I only know this because the mounted commands are to the front of the formations. Next is a shot with some 28mm Warlord Games EIR, again for scale. Here's what they looked like prior to painting. 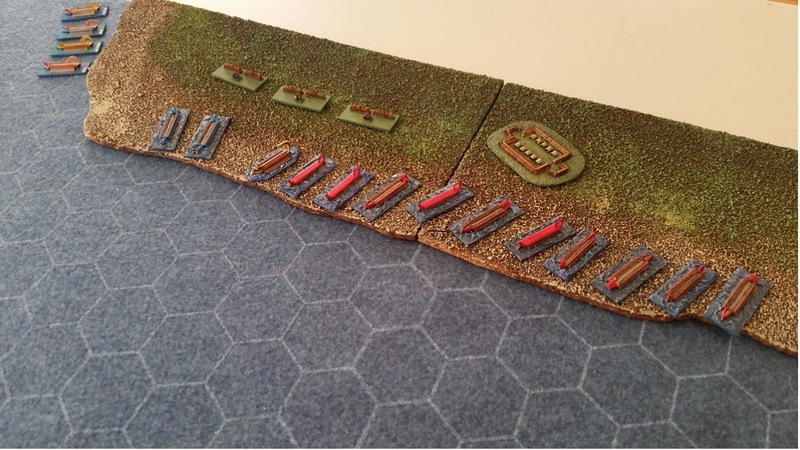 The bases for the troops are cut-down bases from a Perry plastic kit. I just placed another order for another marching fort and several more infantry packs to beef up the look of the units. Who knows, I may use the figures in a 2mm game someday too! Just started on this 120mm resin figure. Another ebay purchase made many years ago - before getting into wargaming, which ended up forgotten about for too long. This kit has a few more parts than the Vlad one, but still shouldn't be too much trouble as most of the figure will be in "Red Devil" armor and a spray can of Testor's red should speed up the process. The horns are from another kit that was cut in half and slots for them were made into the sides of the helmet of this kit. Just something to work on before the 2mm Irregular Romans arrive. I also ordered a pack of Crusader Retiarii for the Gladiator game to add some variety. Perry 28mm figures in the image above for scale comparison. Updates to follow. Thanks for visiting. Here's Antony's command ship for the Actium game. It's a Valiant/Ramming Speed 1/900th scale Deceres model; the same type used for Cleopatra's ship earlier. The pack came with two vessels so worked out very nicely. She's painted up in Seahawk greens and blues - the home team's colors. I was put off from painting it up a few weeks ago after their devastating loss at the Super Bowl. I was going to order a set of fighting towers, but ended up using parts of a GW Empire repeater handgun. The barrels of the gun looked like temple pillars to me so I went with it. Atop the "towers" are spare Langton bolt throwers which help disguise the conversion. The image below has it next to a Langton 1/1200th scale Octeres for size comparison. In that scale the Valiant model will be a monstrous Tessarakonteres. Below is a WIP shot with the GW Empire repeater handgun barrels glued on with the bolt throwers on top. It was an after thought after I had primed the model. I also noticed after the priming that I had knocked off the tail - luckily I found it again and glued it back on - hence the lack of primer. All the ship models are ready for a play-test this coming Saturday. Can't wait to get the 2mm wee-Romans too. 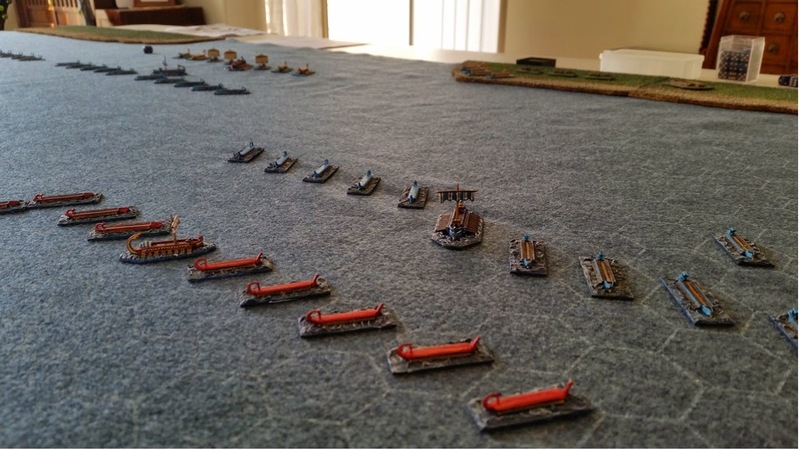 Just a preliminary set-up for another game I've committed to host at the annual local convention, Enfilade!, in May. I used some cork board with dried coffee grounds for the shoreline just to give the game a bit of aesthetics. 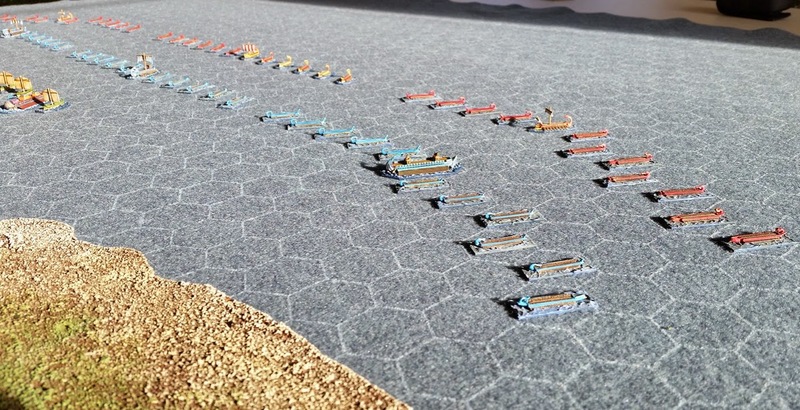 I also ordered some Irregular 2mm Romans and a marching fort to place on the terrain. Looking forward to painting up the little guys as the smallest scale I've painted so far is 15mm. Anyway, here's the initial deployment - well, actually I'll have Antony's forces a bit further out from the shoreline, and Octavian's forces further apart from Antony's. Just wanted to have everything in the photo op. Still working on the Victory Conditions, but one element will be Cleopatra escaping with her treasure ships. View from the shoreline occupied by Octavian's land forces - Antony's large command ship offshore. A bird's eye view from the shoreline. Arruntius facing Octavius in the center, with Cleopatra and her treasure ships in the rear. 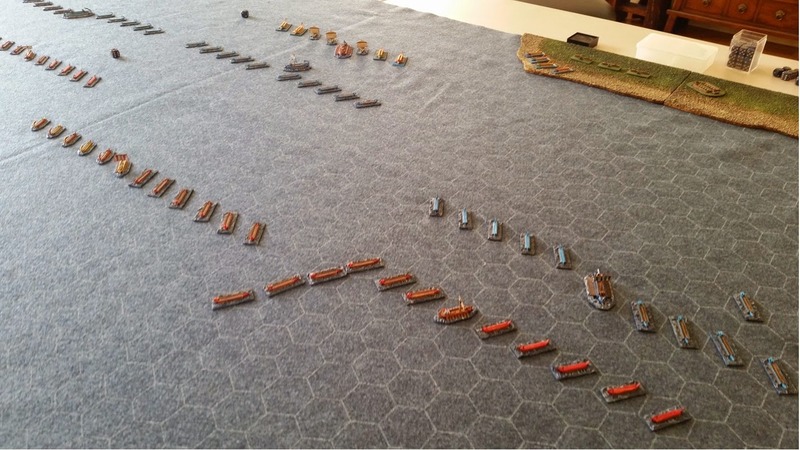 I have a home brew set of fast-play rules based a bit on Hail Caesar and Diadochi. Movement will be hexed based using a nice Hotz mat, of course, which should make movement cleaner and faster. The map below shows Octavian with Agrippa on their left flank, but I have Octavian on the right for the game. I may have his actual placement unknown to Antony's forces, with a Victory Condition being his capture or destruction. I've seen differing numbers of ships involved from various sources. For this game, they'll be close in number for each side. The main difference will be classing more of Antony's fleet with larger vessels. A play-test will follow soon, and I'll be sure to post the results. "You like movies about gladiators?" Okay, it's an oft heard quote, but still a classic, to me anyway. So, this is something I've neglected to see to fruition for far too long. In fact, the excellent Hotz ArtWorks Arena hex game mat has been sitting in a closet for close to three years without ever being bloodied. While toying with the idea of hosting a smallish game at our big con, Enfilade!, in May, yet another search for gladiator rules was made. Not sure why I hadn't noticed Arena Games' Gladiatorial Combat before, but a quick review was made and the $10 USD pdf was purchased. This set has been around for some time, and I think I once played a version of it with robots a buddy hosted a few years ago. It's seems perfect for a con where players should easily grasp the rules with a QRS and Combat stat sheet. The figures are all Crusader minis that were painted some years ago also. As for the rules, at the start of the game each gladiator is given Action and Save Points based on how much armor is worn - more armor means less points for movement, but easier saves - and vice versa. 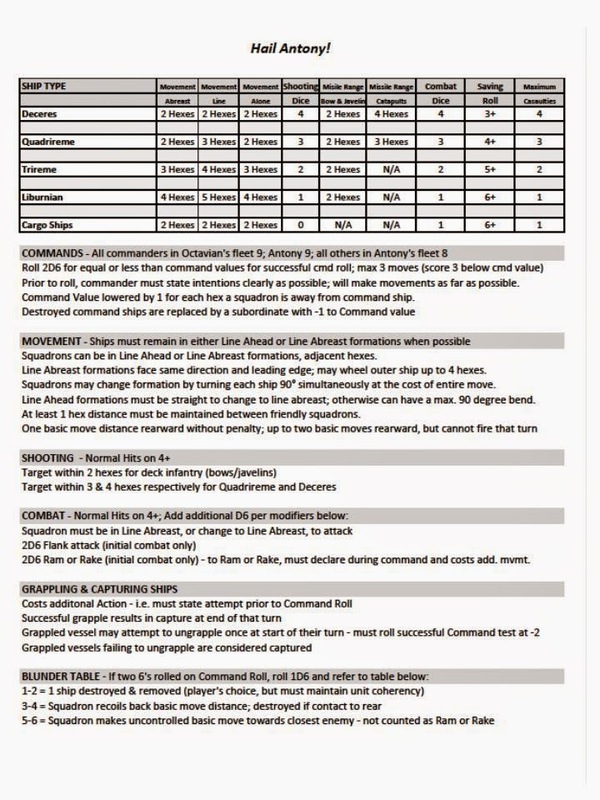 Even though I don't like charts, the Combat Sheet is very simple to use and all hits are made on 6 from a D6. Another D6 of a different color is used to determine hit location on the body. Saves are immediately made using D10 scores equal to or greater than the Save Points. Successful hits are accumulated until max'd out and then damage effects are determined using the easy to read QRS. It'll be nice to host a game for up to 12 players with only 12 figures and no terrrain except for the mat. Figured might as well put the silver spray paint to more use. Here's a Verlinden 120mm resin figure of Vlad Dracula. Rustoleum Silver spray paint was used for the armor; which was then given a wash of Vallejo Black Ink/Stain. Excess stain was wiped off with tissue to allow black lining of the armor as well as giving it a campaign look. The horse was first sprayed with flat black and then lightly over sprayed with a dark brown. This and the spraying of the armor really sped up the process. "What a monstrous floating head?!" Vlad. Photo-bombed by the news! The shield bears the heraldry of the Order of the Dragon, which Vlad belonged. The image is faintly etched on the shield as a guide. I'm glad he's finally painted up after all these years being in a box. He was an old ebay purchase before I discovered wargaming and 28mm figures. The figure itself has only a few parts, as most large resin models go - so went together quickly. Using spray paint makes painting the large surface areas a breeze too. If I had an airbrush and knew how to use it, it'd be even better. Here's a size/scale comparison shot with a 28mm figure in front of Vlad, and the recently painted 1/8th scale (approx. 200mm) Monogram/Aurora plastic knight, behind him. My attention now needs to turn to some terrain building for an Actium game which I've committed to hosting at our annual convention Enfilade! in a few months. Some coastline mainly for aesthetics. The sun came out for about 5 minutes this afternoon - long enough to snap these photos of the completed Monogram (ex-Aurora) Gold Knight of Nice painted up as Richard III. Granted, he should have a crown atop his sallet, but I've yet to fashion one. Here he is next to a GW Empire General and bottle of Guinness for scale. The sun kept going back behind cloud cover so the lighting isn't that great, but still a blessing after being socked in with fog for two straight days. The only parts that needed some modification were lengthening the reins a bit. I used a little bit of folded tin foil to extend them. Otherwise the parts go together very nicely. Some master modellers would have issue with seams and fillers, but only a bit of glue was used to close the few gaps. Only a few areas were painted by brush like the red areas, horse's hooves, tail and eyes - and the mostly-hidden head. A can a flat white being used for most of the horse and a can of silver for the armored areas - which make up a good percentage of the entire model. Back to the Superbowl - GO HAWKS!